Beaver Creek is a great 18 hole regulation course located at the Beaver Creek Golf Club facility in Darlington, SC. From the longest tees it presents 6,400 yards of golf for a par of 72. Designed by Jim Robertson, this manicured golf course has well placed sand traps and small to medium sized bermuda greens. The most difficult hole is #16, a 352-yard, par 4. In addition, water hazards come into play on five holes. The club also features a pro shop and grill. The Darlington Country Club is a full service facility. Our club provides a wonderful area for recreation, sports, and dining for many area families and businesses. We have a beautiful 18-hole golf course, great clubhouse for dining, bar facilities for you to relax and fully stocked golf-pro shop with locker and baggage storage rooms. Follow in the footsteps of Gen. William T. Sherman’s Union Army which passed through the Cotton Trail on its way into North Carolina during the Carolinas’ Campaign in 1865. This driving tour highlights the cotton industry from farm to gin and everything in between. Real cotton fields line the roads as the trail goes from I-20 (Bishopville) through Hartsville, Darlington, Society Hill, Chesterfield, Cheraw, Bennettsville, Clio and on to I-95 near Dillon. Many sites along the trail are historic in nature and depict the architecture and “way of life” of the day. From the time cotton was “king” in the South through present day, African-Americans have played a major role in the agricultural developments of South Carolina. This quiet park offers a three-mile boardwalk, five miles of nature trails, countless birds, and a statewide variety of plants and trees, providing a most rewarding spot for hiking, nature study and picnicking. Seven acres of corn planted in a puzzling labyrinth of criss-crossing trails. Educational passport helps children find their way through. A working farm is available for school and group tours. A list of special events and coupons are available on the website. Robyn’s Neck was first organized for private membership in the 1930’s. Since then they have discontinued privet memberships and opened the club to a limited number of guests, while continuing their work with South Carolina’s Department of Natural Resources to enhance every aspect of the deer habitat, and your likelihood of taking trophy-class whitetails from their herds. This 55-acre site is home to a vast variety of plants and flowers, fresh fruits and vegetables, homemade goods and garden accessories. Products such as Christmas trees, pumpkins, watermelons and peaches are abundant in season. Annual festivals include Pee Dee Spring Plant & Flower Festival and Pee Dee Fall Plant & Flower Festival. Open year round, the Market showcases some of the state’s freshest and finest produce but it has also become a prime location for the ornamental horticulture and floriculture industry. Designed by Donald Ross, this well-maintained layout features generous fairways, smooth greens, plenty of sand and water, and a good mix of playable and challenging holes. The 18-hole championship golf course is host to several charity and professional tournaments throughout each year, including the South Carolina Junior Golf Association Players Championship and the Coker College Invitational. Best Hole: No. 16, a 150-yard Par-3 that plays over a lake to a peninsula green that slopes back-to-front and is guarded by bulkheads in front and sand bunkers behind the green. 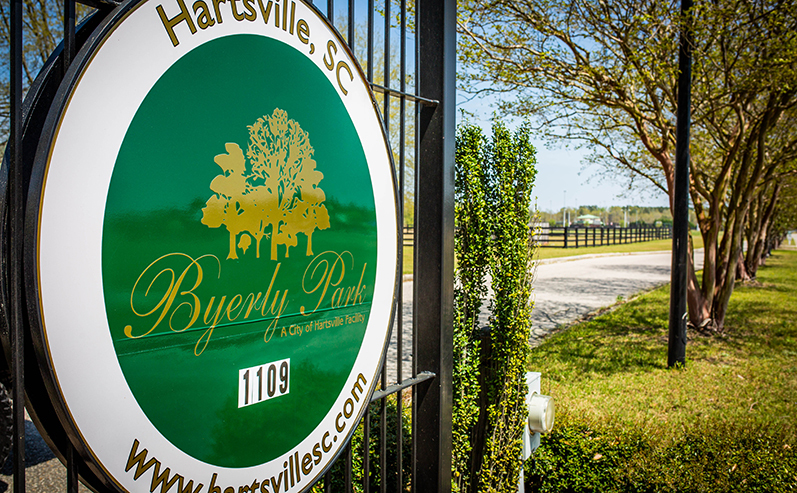 Hartsville Country Club opened in 1926. Located on the bluffs of Black Creek, Kalmia Gardens is on the site of the early 19th-century plantation of Capt. E. Hart for whom Hartsville is named. The Hart House, built in 1820, is the oldest house in the city of Hartsville, SC. Walking trails allow visitors to explore a blackwater swamp, laurel thickets and pine, oak and holly upland. Planting of azaleas, camellias and other ornamentals enhance the natural beauty created by the variety of native plants found in the garden. Tours are available for schools and other groups by calling 843-383-8145. This 93-acre multi-use recreation complex features five soccer fields, four softball/baseball fields, a 400 meter eight-lane track and field facility, two football fields, six tennis courts, 12 horseshoe pits, 1.2 mile walking, jogging, biking trail; picnic area, concessions (during special events/tournaments) and two playgrounds. The most recent additions are Coach TB Thomas Sports Center which offers indoor activites like basketball, volleyball, indoor soccer, plus fitness equipment (treadmills,elipticals, stationary bikes, stair steppers, and three universal weight stations). Our latest addition is Piratesville, a water splash park. This water park is an interactive facility with a pirate ship and water cannons with two slides out of the stern of the ship. Lake H B Robinson is a 2,250 acre man-made lake on Black Creek operated by Progress Energy. Public access is available by public boat ramps and a fishing pier. Lawton Park, listed on the South Carolina Registry of Historic Places, can be found nestled on the shore of beautiful Prestwood Lake. Bring the fishing poles or tennis rackets for a great day at this lakefront park. Don’t forget to pack a lunch to enjoy under the shelters while the kids enjoy the playground. Absorb the history of Lawton by visiting the recently renovated Pavilion. If you are looking for a unique location to host your special event, consider the Lawton Park Pavilion. Complete with a catering kitchen, ballroom with original hardwood floors, two small rooms, elevator, and handicapped accessible restrooms. Though most of the well-conditioned fairways are comfortably wide, a few, such as the dogleg par-4 sixth, require precise tee shots to stay in play. Best Hole: No. 5, a 175-yard par-3 guarded by water on the left side, a front bunkers and a densely wooded hazard on the right, making accuracy a must. Fox Creek Golf Club offers large rolling greens, practice putting green, a large driving range and clubhouse. Fox Creek is an 18-hole course in Lydia, South Carolina. It has been a favorite of players in the area since making its debut in 1988. The course was designed by James Goodson, and it spans 6,903 yards of play from the longest tees for a par of 72, a course rating of 72.7 and a slope of 128. Moree’s Sportsman’s Preserve is an upland game preserve and is the favorite of many who love quail hunting, duck hunting, pheasant hunting, and other outdoor activities in South Carolina. It is encouraged for sportsmen to bring their well managed dogs for bird hunting. Guests may also use Moree’s trained dogs from their onsite kennel.